The Last Drop mobile phase filter's flat filter element sits parallel to the bottom of the reservoir, allowing the Last Drop to filter all but the last 2% of the mobile phase from the reservoir without drawing air into the system. The No-Met polyethylene filter with inert polymeric fittings is designed for applications in which stainless steel in the flowpath is not acceptable, such as those which involve the separation of biomolecules. 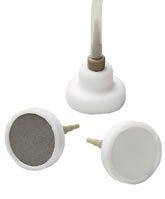 The Cheminert direct-connect mobile phase filters provide point-of-use filtering of common HPLC or FIA solvents. They are designed to connect directly to 1/8" OD PTFE or PEEK tubing using a simple press fit.